This recipe was an experiment… and a huge learning experience. It’s worth posting, because if you learn from my mistakes it would actually be amazing! I wanted an easy recipe to bring to our potluck, and I thought I’d make everything and let it stay warm in the crock pot. Unfortunately that was too much heat for too long and the noodles fell apart. The taste was yummy, the texture not so much. When I make it again I will just serve it immediately. Or if I need it in the crock pot I will take the cooked noodles along separately and add them just before serving. So the picture isn’t the prettiest with those sloppy noodles, but it’s worth trying! 1/2 a package of gluten free noodles, cooked. I used Trader Joe’s Penne Noodles. Melt the butter in a large skillet. Add the onions and sautee them for 10-15 minutes- until they are a nice golden brown. Add the minced garlic and cook for 30 seconds. Mix in the flour and slowly add the broth and milk. Stir until thick and bubbly. When I use rice milk I need to add more cornstarch to thicken it up. 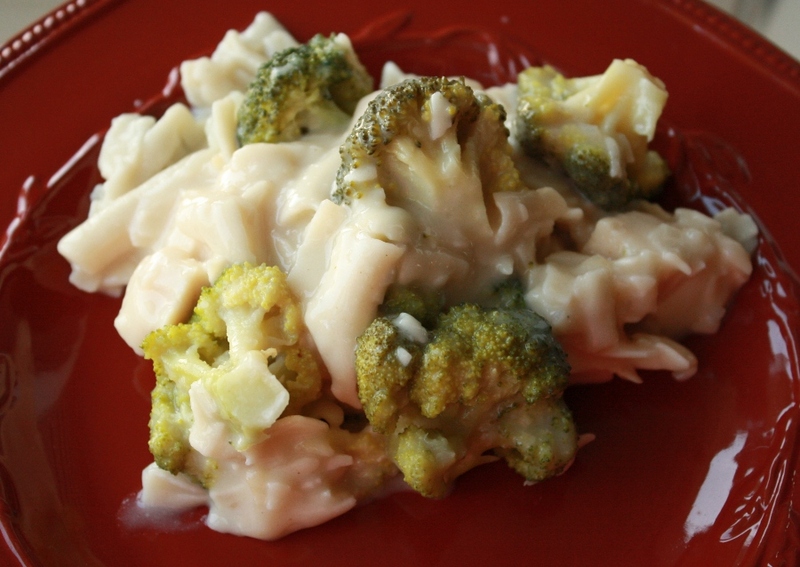 Layer the chicken, noodles, and broccoli in a 9×13 pan and pour the sauce over everything. I also added crushed Sami’s croutons on top (sadly they are not safe for Celiacs so I left it off my husband’s plate). We also sprinkled parmesan cheese on top– very yummy.